The students of the department of Mechanical Engineering, St Joseph Engineering College, Mangaluru have come up with a extruder that develops building materials, especially plastic bricks, from plastic waste. 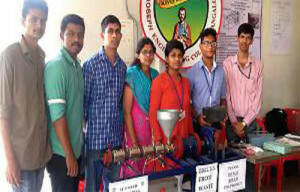 The students made a presentation of this at the exhibition for engineering colleges, as part of National Science Day celebrations at the Pilikula Regional Science Centre on Sunday. Speaking to BM, team member Minal D’ Almeida said that the aim of their presentation was to reduce plastic waste. “For this, we have designed a plastic extruder which plays a prominent part in recycling waste plastic into useful products. This work uses waste plastic and converts them into building materials with the help of an extruder, thereby reducing the plastic waste ,” Minal said. According to the team, with the use of this technology, waste plastic can be effectively converted into useful building material like bricks, interlocks, roof tiles, railway sleeper coaches, paving slabs, retaining blocks and so on. After the team conducted several trials with a variety of plastic wastes processed into composite brick, it was observed that the maximum compressive load sustained by the polypropylene/rubber composite brick is 17.05 tons followed by low density polyethylene (LDPE)/rubber composite bri-ck with 16.55 tons which is much higher than the clay brick which sustained only 9.03 tons. “In simple words, it is much stronger than clay bricks,” she said. Initially, the group that worked in developing this machine included P Varun Kajava, Ranjan H V, Nikhil Lyod Pais, Vikhyat M Naik. Currently, a group of students including Babisha K C, Krishna Moger, Clyde Menezes and Minal D’Almeida are taking this idea forward. A paper on this project was published in the journal of Mechanical Engineering and Automation.